Surgeons must be aware of their outcomes in deciding how to approach DME surgically. The increasing incidence and prevalence of diabetes mellitus in the United States are related to the overall aging population and increasing obesity within that population. Significant health care resources have been directed toward preventive measures to manage obesity and hypertension. Ironically, the improvements in treatment for diagnosed diabetes mellitus are leading to the survival of a larger population at risk for severe diabetic ocular pathology. • Vitreoretinal surgeons can expect to see an increasing population at risk for diabetic ocular disease. • Advances in imaging technologies, surgical instrumentation, and visualization of the ILM with staining allow surgeons to employ vitrectomy earlier, with improved outcomes, in patients with DME. • Clinical experience varies, and surgeons must adjust their indications and surgical approaches to maximize outcomes for their patients. The major causes of vision loss in patients with diabetes are progression to proliferative diabetic retinopathy, development of diabetic macular edema (DME), and early onset of cataract. The use of anti-VEGF medications has altered the landscape remarkably for diabetic patients and the care that ophthalmologists can provide for them. Anti-VEGF therapies have demonstrated anatomic improvement in both advanced diabetic retinopathy and DME. For many vitreoretinal specialists, use of an anti-VEGF agent is now the first line of therapy for diabetic ocular disease requiring treatment. DME affects both visual function and anatomy, and advances in imaging with optical coherence tomography (OCT)—including spectral-domain OCT (SD-OCT), swept-source OCT, and OCT angiography—have improved our understanding of the anatomic effects of the disease. The ability to couple these advanced imaging tools with targeted intravitreal therapies employing anti-VEGF and/or steroidal agents has greatly improved outcomes for patients without the need for traditional surgical intervention. At the same time, advances in surgical management, including enhanced fluidics, rapid vitrector cut rates, widefield viewing and illumination, and precise access to the retinal microarchitecture with small-gauge instrumentation, enable the consideration of surgery in eyes previously deemed inoperable. The Diabetic Retinopathy Clinical Research Network (DRCR.net) has undertaken, and continues to undertake, large-scale clinical studies assessing our evolving treatment approaches. Further, industry continues to explore novel treatment targets and improved delivery modalities to expand our pharmacotherapeutic armamentarium. No consensus on management of diabetic retinopathy exists, but the best data available suggest that early screening and referral are beneficial. Encouraging systemic health is a mainstay of care for these complex patients. Particularly important are control of blood sugar levels, control of hypertension, and maintenance of renal function. For the retina specialist, OCT imaging and indirect ophthalmoscopy are the standards for evaluation of diabetic ocular disease. In our own practice, we have shifted to earlier treatment of DME, using SD-OCT imaging to guide anti-VEGF treatment. We use a treat-and-adjust therapy regimen, in which intravitreal therapy is adjusted based on clinical examination at the time of treatment. This approach mandates complete clinical assessment of each patient prior to intravitreal injection. In our practice, we find that the individual choice of anti-VEGF agent is less critical than the intervals between treatments. Prior to the availability of OCT, determination and quantification of vitreomacular adhesion or traction was extremely difficult and required excellent macular contact lens evaluation skills. Even in the hands of an experienced clinician, recognition of the vitreomacular interface was difficult at best. Adoption of OCT enabled immediate and reproducible recognition and grading of the type and extent of DME and the status of the vitreous, epiretinal membrane (ERM), and inner limiting membrane (ILM) in these complex patients. ILM peeling is enhanced by good visualization of the ILM, allowing safe surgical removal. Visualization of the ILM is typically facilitated through the use of chromophoric dyes that bind to the ILM. In the United States, the agent most often used for staining is indocyanine green (ICG). Internationally, surgeons often use Membrane Blue-Dual (DORC International), which combines brilliant blue G and trypan blue dyes. Virtually all of these vital dye compounds have shown the potential for retinal toxicity, but we have not observed toxicity in more than 1,000 surgical cases in which we used ICG, suggesting that toxicity can be avoided when it is safely applied. Before injecting the ILM staining dye, we typically complete the PPV, elevate the hyaloid membrane, remove obvious ERMs, and lower the intraocular pressure to 5 mm Hg. Then we gently drop the ICG, first at the nerve and then moving to the macula while avoiding the foveal center. We then rapidly remove the dye to achieve minimal staining. We typically remove the ICG within 30 seconds, using active cutting on the vitrector, until we have a good view of the retina, and then with active suction over the optic nerve head. Lastly, we peel the ILM with a focus on achieving an atraumatic approach. We employ either a pinch-release-peel approach with ILM forceps or initiate the ILM peel with a Finesse Flex Loop scraper (Alcon/Grieshaber) and then use the ILM forceps. We recently reported on using the cutter to remove the ILM, but we employ this rarely, typically in cases in which the ILM elevates easily and peels perfectly. Although staining of the ILM is the most important recent surgical advance in ILM removal, improvements in technology have also had significant impacts on the ease and safety of this surgical technique. Over the past decade, manufacturers have improved viewing options (widefield contact and noncontact systems), illumination (enhanced light sources, better endoillumination probes, directional probes, and chandelier systems), vitreoretinal cutting (faster cut rates, better port designs, dual-drive cutters), and fluidics, and have introduced valved trocar entry systems. For our practice, these advances are manifested in our approach to microincisional vitrectomy surgery (MIVS). The availability of MIVS has shifted our surgical window, allowing patients to be operated on earlier in their disease processes while also lowering complication rates (fewer iatrogenic retinal tears, less intraoperative bleeding, less intraoperative hypotony, and lower sclerotomy site compromise) We also execute fewer instrument changes because of the versatility of the instruments. The aforementioned shift in the therapeutic window means that surgery becomes a viable option in more patients with visually compromising macular pathology. Earlier surgical intervention has been shown to achieve better visual outcomes for patients. Much of surgery depends on the assessment of the risk-to-benefit ratio. Everything that shifts the curve by lowering risk enables more intervention to improve benefit. Many surgeons are now operating on macular pathology in patients with visual acuities better than 20/40, and some are even operating in eyes with traditional visual acuity measurement of 20/20 but with severe visual compromise as perceived by the patient (metamorphopsia, contrast sensitivity compromise, severe floaters). Our service has not moved to operating on 20/20 eyes, but we do appreciate that this is only possible when the chances of intraoperative and postoperative surgical complications are remote. With the advances outlined above—advanced imaging with OCT, enhanced surgical instrumentation, and superb visualization of the ILM with staining—we have shifted our practice to consider ILM staining in virtually all cases with complex macular pathology. MIVS surgery using valved trocars with either 23- ,25-, or 27-gauge instrumentation is ideal when employed with advanced high-speed cutting (10,000 cpm), contact widefield viewing, ICG staining, and removal of the ILM with forceps peeling. At the inaugural Retina World Congress, we presented the results of an institutional review board–approved retrospective series of 89 eyes of 76 patients undergoing this surgical approach for DME deemed unresponsive to pharmacotherapy in the Miami Ocular Oncology and Retina surgical service. Mean patient age was 64 years, mean entry visual acuity was 20/400, and mean duration of macular edema was 11 months. All patients had received intravitreal pharmacotherapy with bevacizumab (Avastin, Genentech) and/or triamcinolone acetonide injectable suspension (Triesence, Alcon) prior to surgery. At a mean follow-up of 30 months, visual acuity had improved to 20/50, and 62% of patients experienced a 3 line or greater improvement in visual acuity. 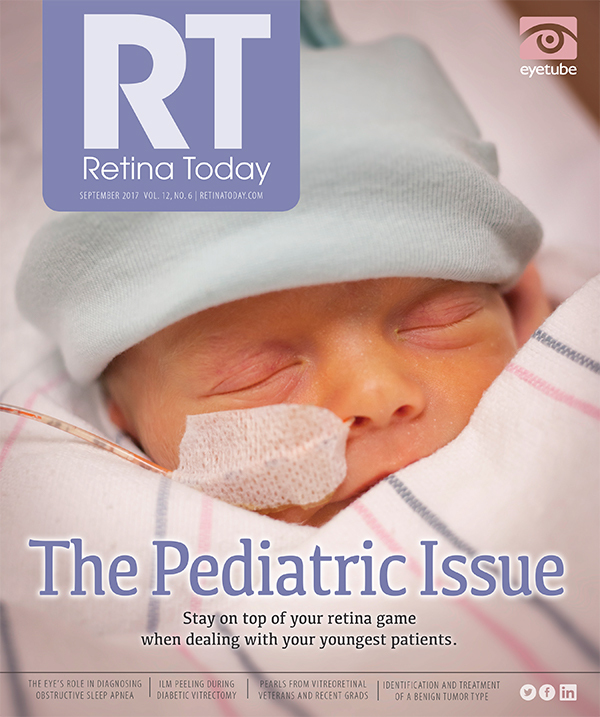 Postsurgical follow-up was critical, as 47 of the 76 patients (62%) developed recurrent retinal edema that was responsive to intravitreal pharmacotherapy. No patients in the series developed endophthalmitis, hypotony, or retinal detachment within the follow-up window. Of note, every patient undergoing ILM peeling received intravitreal triamcinolone acetonide at the conclusion of the surgical procedure. The intraoperative placement of a therapeutic dose of steroid significantly benefited the rapidity of resolution of retinal edema, both preexisting and potentially surgically induced. The results in this series are supported by similar data from multiple centers using ILM peeling during MIVS for complications of diabetes requiring surgical intervention. Nonetheless, MIVS management is not our first line of therapy. This approach, like virtually all defined surgical approaches in vitreoretinal management, is not without controversy. For this approach to be effective, the individual surgeon must be aware of his or her own outcomes. This information is easily attainable in the era of electronic health records, and it enables the surgeon to evaluate indications and outcomes within his or her own surgical practice. • Intravitreal gas tamponade is necessary for DME management. One concern that has been discussed often is surgical management in the face of large central cystic DME. Historically, surgery has avoided membrane peeling or ILM peeling in these areas. Recent data from eyes with extensive schisis or cystic myopic macular degeneration has suggested the exact opposite strategy, whereby, during surgical intervention, the release of both ERM and ILM with intravitreal gas tamponade has been able to markedly restore the anatomy. These data, and our personal surgical experience, suggest that peeling ILM in the face of large cystic DME does not increase the incidence of full-thickness macular hole. In these complex cases, atraumatic removal of the ILM coupled with intravitreal gas tamponade yields excellent anatomic and visual function. • Intravitreal gas tamponade is not routinely necessary and should be employed only when there is concern of a full thickness macular hole or retinal tear. These clinical pearls address our response to much of the controversy surrounding surgical management of DME. Vitreoretinal surgeons can expect to see an increasing population at risk for diabetic ocular disease. We will likely find ourselves employing treatment strategies that incorporate MIVS earlier in our patients who do not respond to nonsurgical treatment of DME. 1. Ghassemi F, Bazvand F, Roohipoor R, Yaseri M, Hassanpoor N, Zarei M. Outcomes of vitrectomy, membranectomy and internal limiting membrane peeling in patients with refractory diabetic macular edema and non-tractional epiretinal membrane. J Curr Ophthalmol. 2016;28(4):199-205. 2. Hartley KL, Smiddy WE, Flynn HW Jr, Murray TG. Pars plana vitrectomy with internal limiting membrane peeling for diabetic macular edema. Retina. 2008;28(3):410-419. 3. Harbour JW, Smiddy WE, Rubsamen PE, Murray TG, Davis JL, Flynn HW Jr. Pars plana vitrectomy for chronic pseudophakic cystoid macular edema. Am J Ophthalmol. 1995;120(3):302-307. 4. Adelman R, Parnes A, Michalewska Z, Parolini B, Boscher C, Ducournau D. Strategy for the management of diabetic macular edema: the European vitreo-retinal society macular edema study. Biomed Res Int. 2015;2015:352487. Erratum in: Biomed Res Int. 2015;2015:694902. 5. Kumagai K, Hangai M, Ogino N, Larson E. Effect of internal limiting membrane peeling on long-term visual outcomes for diabetic macular edema. Retina. 2015;35(7):1422-1428. 6. Nakajima T, Roggia MF, Noda Y, Ueta T. Effect of internal limiting membrane peeling during vitrectomy for diabetic macular edema: systematic review and meta-analysis. Retina. 2015;35(9):1719-1725. 7. Walia HS, Shah GK, Hariprasad SM. ILM peeling a vital intervention for many vitreoretinal disorders. Ophthalmic Surg Lasers Imaging Retina. 2014;45(2):92-96. 8. Yamada Y, Suzuma K, Ryu M, Tsuiki E, Fujikawa A, Kitaoka T. Systemic factors influence the prognosis of diabetic macular edema after pars plana vitrectomy with internal limiting membrane peeling. Curr Eye Res. 2013;38(12):1261-1265. 9. Sisk RA, Murray TG. Combined phacoemulsification and sutureless 23-gauge pars plana vitrectomy for complex vitreoretinal diseases. Br J Ophthalmol. 2010;94(8):1028-1032. 10. Parke DW 3rd, Sisk RA, Murray TG. Intraoperative intravitreal triamcinolone decreases macular edema after vitrectomy with phacoemulsification. Clin Ophthalmol. 2012;6:1347-1353. 11. Parke DW 3rd, Sisk RA, Houston SK, Murray TG. Ocular hypertension after intravitreal triamcinolone with vitrectomy and phacoemulsification. Clin Ophthalmol. 2012;6:925-931. 12. Villegas VM, Gold AS, Wildner A, Latiff A, Murray TG. Intravitreal triamcinolone acetonide: a “real world” analysis of visual acuity, pressure and outcomes. Int J Ophthalmol. 2016;9(5):789-791. • associate director, retina service, Massachusetts Eye and Ear, Boston, Mass. • professor of ophthalmology and public health sciences, Penn State Eye Center, Penn State College of Medicine, Hershey, Pa.